(April 11, 2018) -- The University of Texas at San Antonio (UTSA) Voice Area in the Department of Music, in collaboration with The Texas Voice Center at UT-Health San Antonio, is hosting a special event for World Voice Day. 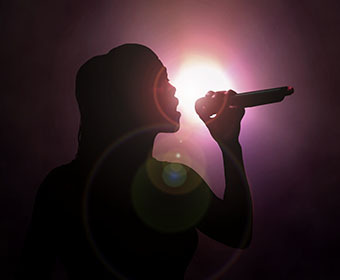 The lecture and interactive workshop designed for speakers and singers is Monday, April 16 at noon in the Arts Building Recital Hall (Arts 2.03.02) on the UTSA Main Campus. It is free and open to the public. World Voice Day will be celebrated all over the world through singing events, health screenings, workshops and lectures. The goal of the day is to encourage people to learn to take care of their voice through education, training and research. The event provides UTSA students, especially those in music education, with the opportunity to learn more about vocal health. These students, who will serve as the next generation of educators in South Texas and around the country, will be better equipped to spread key health messages to those they teach. Additionally, the event will give the UTSA Voice Area and the Texas Voice Center the chance to share their expertise with the San Antonio community. “Events like these enable us to transmit evidence-based best practices to students, future educators, faculty and the community as a whole,” Nix said. Professor and Dr. Blake Simpson, a world-renowned surgeon and the lead laryngologist at UT-Health San Antonio, will lead an interactive workshop for speakers and singers that includes a live voice endoscopic demonstration and real-time acoustical analysis of the speaking and singing voice in action. Learn more about World Voice Day at UTSA. Explore the UTSA Department of Music. Learn more about the UT-Health San Antonio Voice Center.